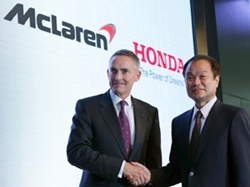 Honda has announced its decision to participate in the FIA Formula One World Championship from the 2015 season under a joint project with McLaren, the UK-based F1 corporation. (From left) Whitmarsh and Ito. From 2014, new F1 regulations require the introduction of a 1.6 liter direct injection turbocharged V6 engine with energy recovery systems. The opportunity to further develop these powertrain technologies through the challenge of racing is central to Honda’s decision to participate in F1. Throughout its history, Honda has passionately pursued improvements in the efficiency of the internal combustion engine and in more recent years, the development of pioneering energy management technologies such as hybrid systems. Participation in Formula 1 under these new regulations will encourage even further technological progress in both these areas. Furthermore, a new generation of Honda engineers can experience the challenges and the thrills of operating at the pinnacle of motorsport. Of course, the following day our Bernie, the patron saint of pit stops, was intimating that BMW would be coming back in, a notion that was strongly denied by BMW headquarters.